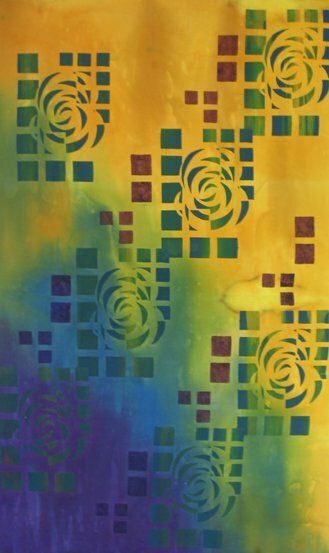 Screen printing on fabric opens the door to so many possibilities. This workshop will reveal that screen printing is not difficult or expensive. We will make simple, basic screens that will meet everyone’s needs, as well as learn the appropriate paints, dyes and tools to use. Four different techniques will be covered including freezer paper stencils and other masks, soy wax on the screens with thickened dyes, Thermofax printing and using gel and glue mediums for foils and special effects. Time will be spent on good design fundamentals, repeating imagery and overlaid colours and patterns. We will leave with a range of surface design ideas and a group of samples for reference or to use in future projects.